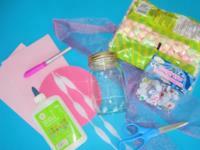 Use pastel-coloured marshmallows for an extra pretty result. 1. Gather your material. 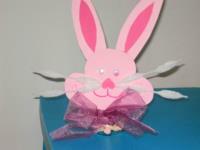 You will need pastel-coloured miniature marshmallows, two shades of pink Fun Foam, pipe cleaners, white glue and/or hot glue, scissors, a marker, wiggly eyes, a glass jar, and wide Easter ribbon. 2. Pour marshmallows in the jar until is half full. Close the lid. 3. 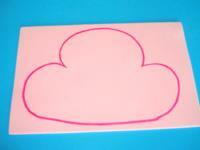 Draw the outline of an Easter bunny face on the light pink Fun Foam. Cut it out. 4. 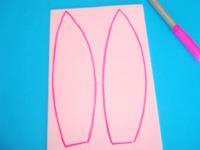 Draw two bunny ears and cut them out. 5. Cut the centre portion of the bunny's ears and a small heart-shaped nose out of the darker Fun Foam. 6. Glue the centre part of the ears on the long bunny ears and glue them behind the bunny head. 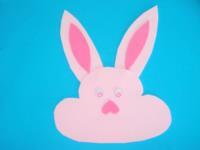 Add the bunny nose (glue the heart upside down) and wiggly eyes. 7. 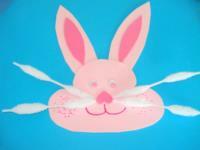 Use the marker to draw mouth and glue moustaches (cut pipe cleaners) on either side of the bunny's nose. 8. 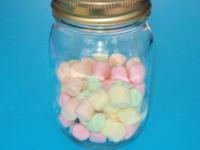 Glue the bunny head on the glass jar so that you can see the marshmallows at the bottom of the jar. 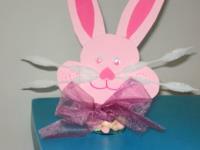 Use the ribbon to add a bow tie and you'll have the perfect Easter centrepiece!